We had fabulous slightly rainy weather this weekend setting up the tipi for Aboriginal Day. Jess, Wayne, Rick, and I worked our butts off setting up 8 tipi for this event. I didn’t remember to get shots of the tipi we set up inside but I did get shots of the ones outside. I actually got a picture or two of my favorite superhero “Jess the Incredible”. It is a beautiful spring day here in the Okanagan. The trees are in bloom and all the birds are nesting. We thought it might be a good time to enter the online world and share our tipi adventures with everyone. Jessie – The Whip – is the backbone of our little organization – she is on the go from sun up to sun down, and will take you with her if you are not careful! Wayne – The Muscle – almost impossible to stop once he starts a job. Watch out for the razor wit though! Linda – Creative Diva – I get to do the art stuff and the grunt work – and I grunt/grumble a lot while doing both! We all have pooled our talents into a unique little niche. We rent out tipi to interested parties. If you want a off the wall wedding, or party – call us! 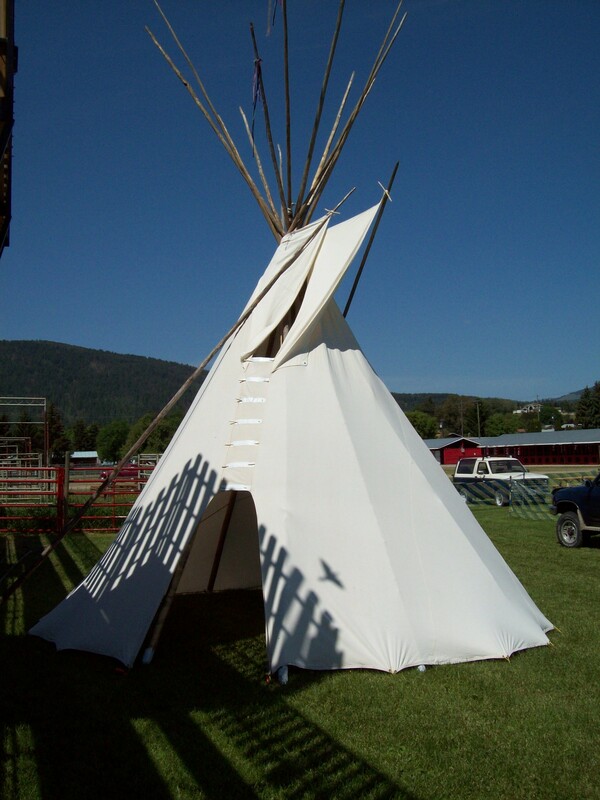 We will bring the tipi to you, set it all up, and when the party is over we come back and take it all away again. Take a look at some of the pictures of the places we have been so far and the places we have yet to be.